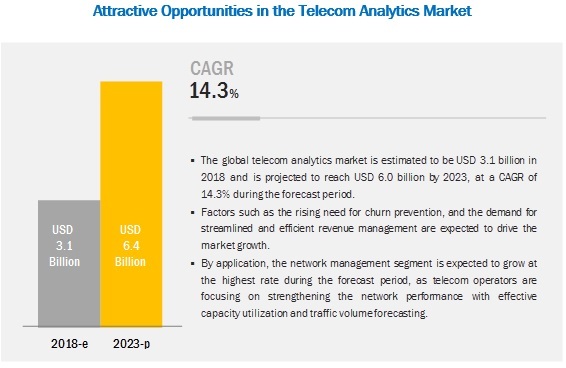 [136 Pages Report] The telecom analytics market size is expected to grow from USD 3.1 billion in 2018 to USD 6.0 billion by 2023, at a Compound Annual Growth Rate (CAGR) of 14.3% during the forecast period. The factors such as the growing need for churn prevention, increasing demand for effective revenue management, and rising attacks and suspicious activities are expected to fuel the market growth. However, the lack of awareness of telecom analytics among telecom operators is expected to restrain the market growth. Moreover, the significance of Private Branch Exchange (PBX) in internal operations, vulnerability of mobile devices, and use of customer and network data analytics to devise the targeted upselling strategy for effective subscriber engagement are expected to create opportunities. The telecom analytics market by component covers software and services. The software segment outperforms the services segment and would see maturation in the future, due to a higher adoption of software. Telecom analytics software are currently being deployed to cater to complex Business Intelligence (BI) requirements of the telecom industry vertical. These requirements include churn reduction; fraud detection; risk management; cross-sell and upsell product and services plans; customer segmentation and analysis; revenue management; and security and compliance. Consulting services mainly steer around the critical issues and opportunities related to strategies, marketing, operations, technologies, mergers and acquisitions, and finance, leading to increased effectiveness, boosted performance, reduced costs, and enhanced resilience. Consulting in the telecom analytics market is poised to grow at a steady speed, as companies in the telecom industry vertical are realizing the significance of analytics in their value chain and are selecting appropriate technologies and vendors based on their requirements and budgets. The cloud deployment model is expected to grow at a higher CAGR during the forecast period. Cloud-based solutions are gaining a firm hold in the market due to various benefits, such as cost control, resource pooling, and less implementation time. 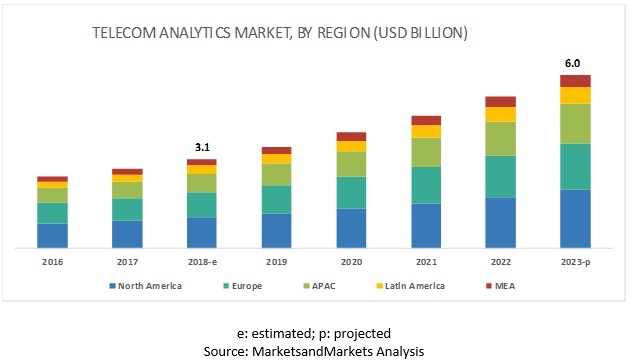 The global telecom analytics market by region covers 5 major geographic regions, namely, North America, Asia Pacific (APAC), Europe, Middle East and Africa (MEA), and Latin America. North America is expected to account for the largest market size during the forecast period. It is expected to hold the highest market share and dominate the market from 2018 to 2023, due to the presence of a large number of solution vendors in the US. The APAC region is witnessing significant growth opportunities, owing to growing technology expenditure in major countries, such as Japan, China, and India and rising demand for cost-effective analytical software and services by Small and Medium-sized Enterprises (SMEs). The telecom analytics market comprises major solution providers, such as SAP (Germany), Oracle (US), IBM (US), SAS Institute (US), Adobe (US), Cisco (US), Teradata (US), Micro Focus (UK), TIBCO (US), MicroStrategy (US), Tableau (US), Panorama Software (Canada), Qlik (US), OpenText (Canada), Alteryx (US), and Sisense (US). In January 2019, IBM collaborated with Vodafone to enable businesses to integrate their cloud computing systems with 5G network and support new technologies, such as machine learning. Under this collaboration, Vodafone would pay USD 550 million to IBM and provide IBM’s AI and automation technologies to networked businesses. In July 2018, SAS released a new version of its SAS Viya platform with an emphasis on providing greater interpretability and transparency in AI. SAS Viya now features advanced analytics with built-in frameworks, such as Local Interpretable Model-Agnostic Explanations (LIME) and Impact, Confidence, and Ease (ICE); these frameworks ensure fairness and transparency for organizations deploying AI solutions. What are the opportunities in the telecom analytics market? The study involves 4 major activities to estimate the current market size of the telecom analytics by component that include software and services. Exhaustive secondary research was done to collect information about the market, peer market, and parent market. The next step was to validate these findings, assumptions, and sizing with the industry experts across the value chain through primary research. Both top-down and bottom-up approaches were employed to estimate the overall market size. Thereafter, market breakdown and data triangulation procedures were used to estimate the market size of segments and subsegments. In the secondary research process, various secondary sources, such as Hoovers, Bloomberg BusinessWeek, and Dun & Bradstreet, were referred to, to identify and collect information for this study. These secondary sources included annual reports; press releases and investor presentations of companies; white papers, certified publications, and articles by recognized authors; gold standard and silver standard websites; business analytics technology, Research and Development (R&D) organizations; regulatory bodies; and databases. This research report categorizes the market based on software, services, deployment models, organization size, and regions.